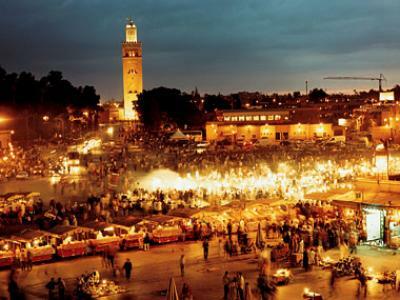 Marrakech, which means land of God, is the 3rd largest city in Morocco after Casablanca and Rabat. 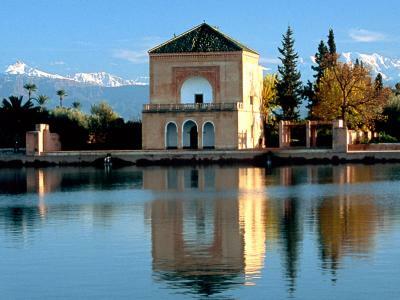 Located at the foothills of the Atlas Mountains, it is just a couple of hours away from the tip of the Sahara Desert. Marrakech offers much to do and see. One can spend a whole day dedicated to wandering around the souks, bargaining for deals. Nuerous other attractions including a few museums are in the area as well. Djemaa El-Fna highlights the night with musicians, dancers, and story tellers. By day, this busy square is filled with snake and monkey charmers. Next to this area is the Souks, the markets of Marrakech. 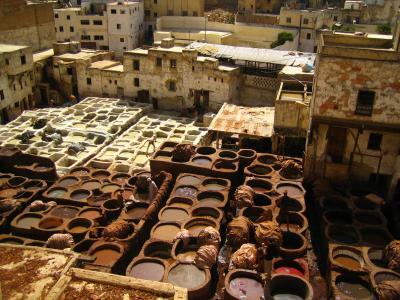 From spices to shoes, jellabas to kaftans, tea pots to tagines, you can find and bargain for all of that here. Expect to pay higher prices than a local would, so work those bargaining skills. The Koutoubia Mosque right beside Djemaa El-Fna, is said that the minaret of the mosque of Marrakech as the Eiffel tower is to Paris. During the evening, the mosque is beautifully lit. The Saadian Tombs, discovered during the beginning of the 20th century have been preserved as if they were from the glory days of the Saadian rulers. It was inaccessible at one point, so they remained untouched for centuries. Inside, you'll find large amounts of Zelij, which are Moroccan tiles. The place isn't big, but it's worth a visit. 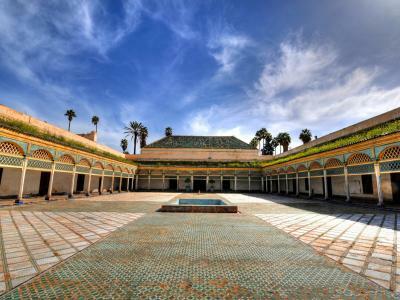 The Dar Si Saïd Museum is a palace that contains many different artifacts through the ages from Morocco, which includes wood carvings, weapons, and musical instruments. You will also find collections of art, carpets, clothing, along with pottery and ceramics. Ben Youssef Madrassa is one of the largest Madrassas in the North Africa. This school, which is attached to the Ben Youssef Mosque holds beautiful art and architecture. El Bahia Palace is a gorgeous palace with a nice garden, peaceful courtyards, and various plants. The El Badi Palace on the other hand is now in ruins and inhabited by birds and stray cats. The Menara gardens located to the west of the city has a mixture of orchards and olive groves. In the center of it all is a pavilion, which was build in the 16th century. This site is a popular scene on postcards.